Colles fx: m/c d/t FOOSH+pronation. m/c inOSP/elder women. Rare in men and if occurs need DEXA to avoid hip Fx etc. Young pts: high-energy trauma. 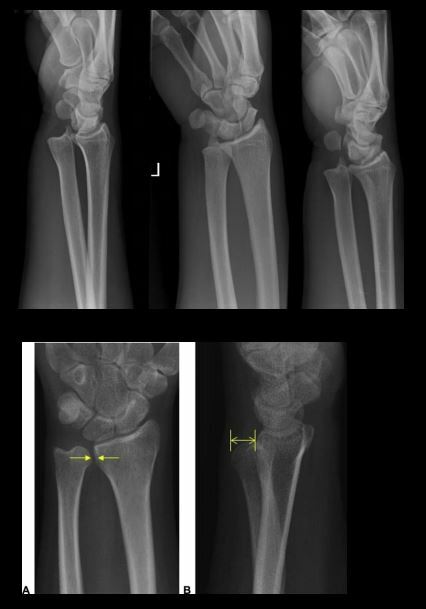 Typically extra-articular.50%-cases show Ulna styloid (US) Fx. Complications: dinner fork deform, CRPS, DJD, nerve entrapment. Imaging: x-rad is sufficient, CT in complex Fx, MRI helps with ligament tears and TFC. 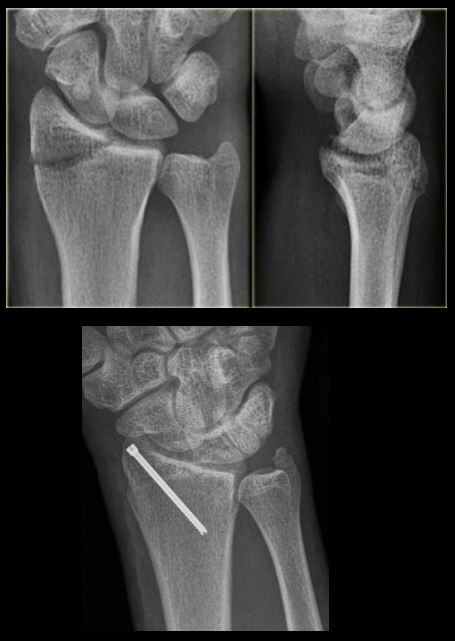 Rx: if extra-articular and <5-mm distal radius shortening and <5-degree dorsal angulation closed reduction+casting is sufficient. ORIF in complex cases. Smith Fx: Goyrand in French literature. Considered as reversed Colles, otherwise almost identical, I.e., 85% extra-articular, 50%US Fx, OSP/elderly women, young pts-high-energy trauma. Differences: mechanismFOOSHwith flexed wrist thus m. Less frequent. Rx: similar approach as in Colles. 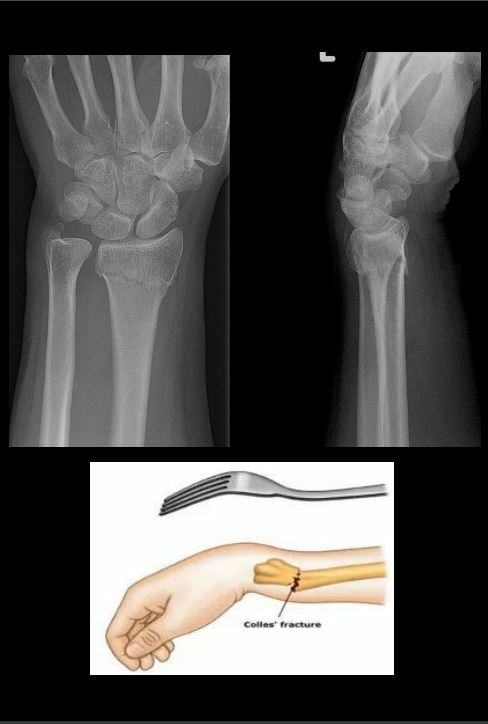 Barton fx: FOOSH, impaction of distal radius similar to Colles but the Fx line extends from the dorsal radial aspect into radiocarpal joint resulting with dorsal slip/dislocation of the carpus. 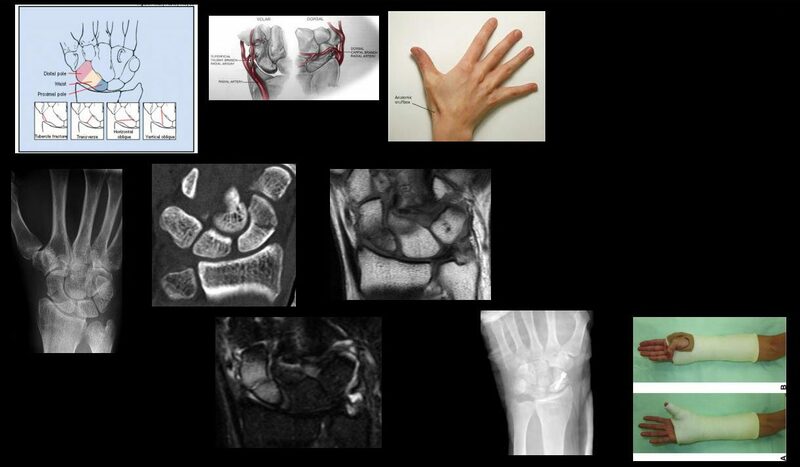 Chauffeur's/backfire Fx aka Hutchinson Fx: intra-articular Fx of Radial styloid. The name derives from the time when the car had to be started with a hand crank that could backfire inducing wrist dorsiflexion and radial deviation. Imaging: x-radiography is sufficient. CT may be helpful if Fx not readily shown by x-rays. 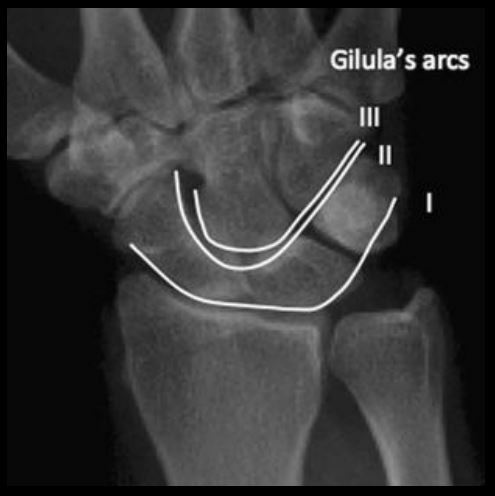 Die-Punch Fx: impaction Fx by the Lunate bone into distal articularLunate fossa of the Radius. IntraarticularFx. Derives its name from a technique to shape (impress) a hole in industrial machining "die-punch. "FOOSH injury. Imaging: 1st step x-rays, may be equivocal d/t subtle depression of the Lunate fossa then CT scanning is most informative. Rad Dx: impacted lunate fossa region with intra-articular Fx extension. 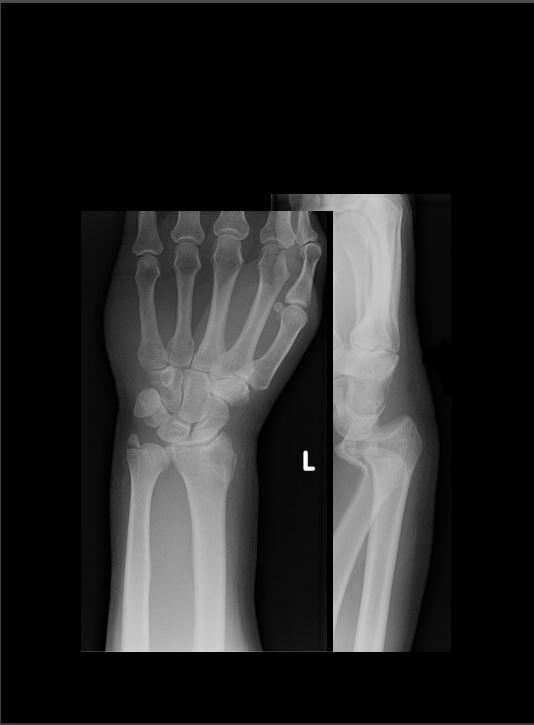 This can present as a comminuted Fxarticular Fx of the Distal Radius. Scaphoid bone Fx: m/c Fx carpal bone. D/tFOOSH wrist extended radially deviated. Location of Fx is most important to prognosis: Waist-m/c location (70%). May have 70-100%chance of AVN. Proximal pole Fx: 20-30% with a high risk of non-union. Distal pole-10%shows better prognosis. Distal pole Fx is m/c in children. Key clinical sign; pain in the snuffbox. 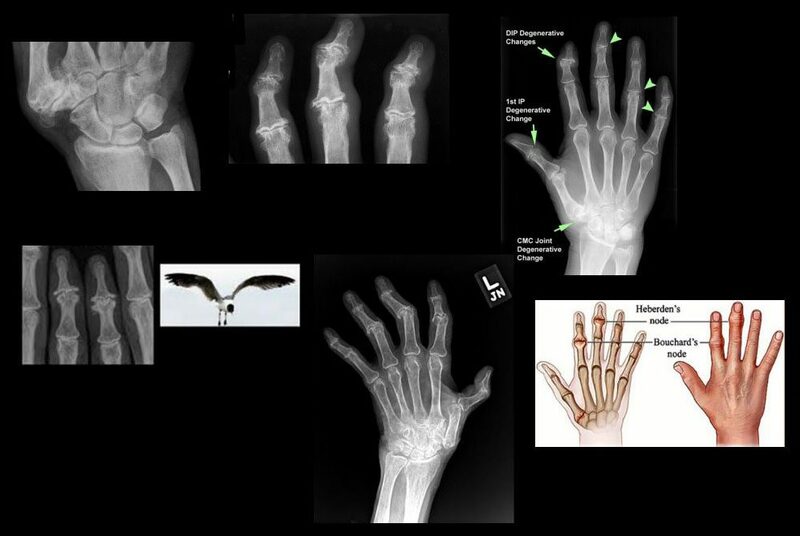 Imaging: 1st step-x-radiography but 15-20%missed d/t occult Fx. Special views required. Thus MRI is the most sensitive and specific for early occult Fx. Bone scintigraphy has98/100% specificity & sensitivity esp. 2-3 days after the onset. Key rad. 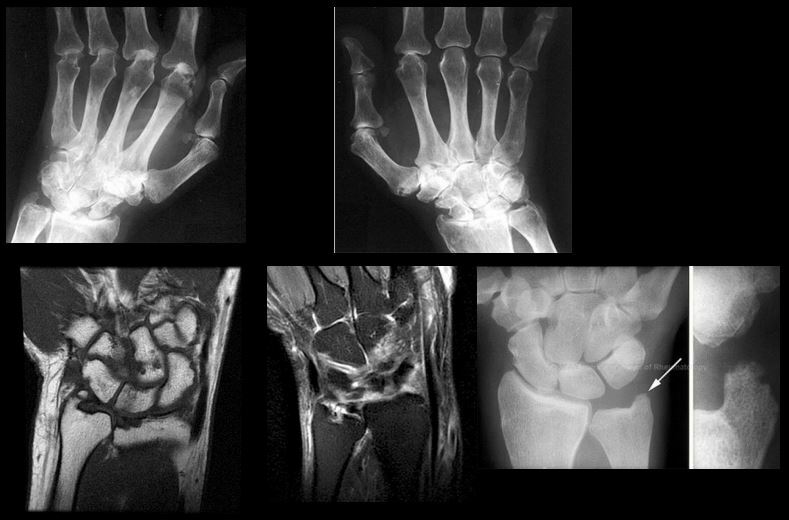 Dx: Fx line if evident, displacement and obscuration of scaphoid(navicular) fat pad, examine for scapholunate dissociation. If proximal bone appears sclerotic-AVN occurred. MRI: low on T1 & high on T2/STIR/FSPD d/t bone edema, a low signalFx line can be noted. 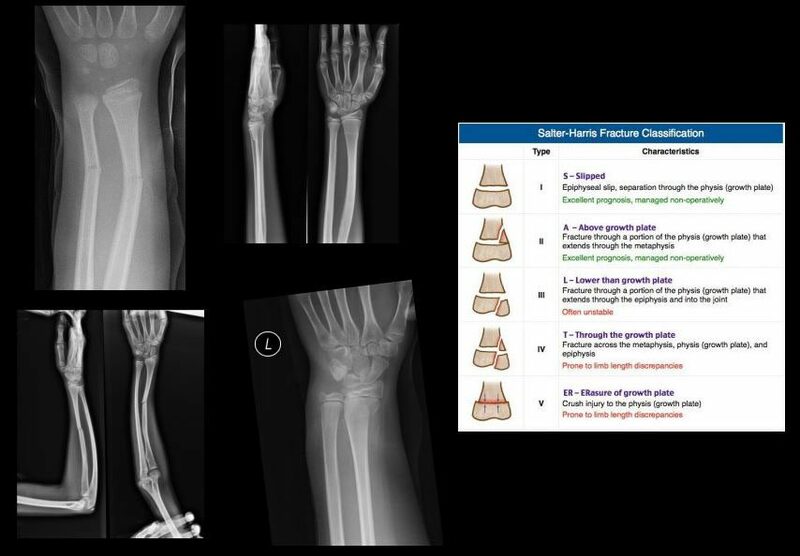 Rx: Spica cast should be applied if clinically suspected even w/o x-ray findings. For waistFx-cast for 3-mo for prox pole 5-mo immobilization. ORIF or percutaneous pinning with a Herbert screw. 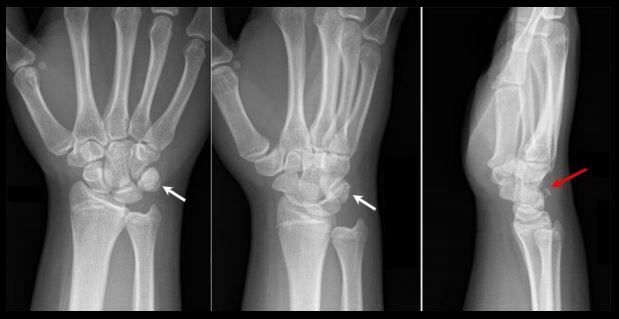 SNAC wrist: scaphoid non-union advanced collapse. 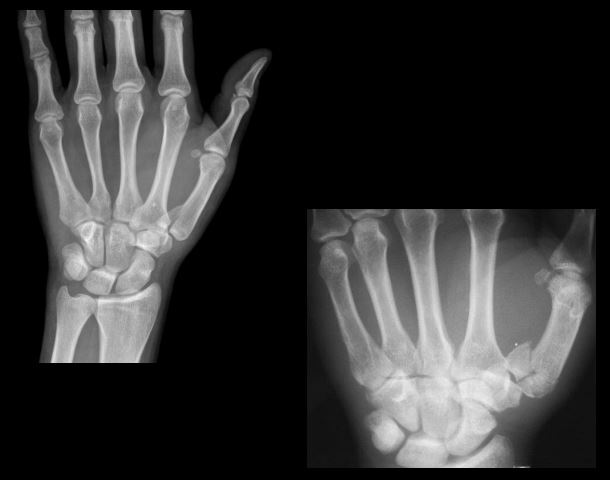 Often d/t non-union and dissociation of scapholunate ligaments (SLL)with progressive radiocarpal and intercarpalDJD. 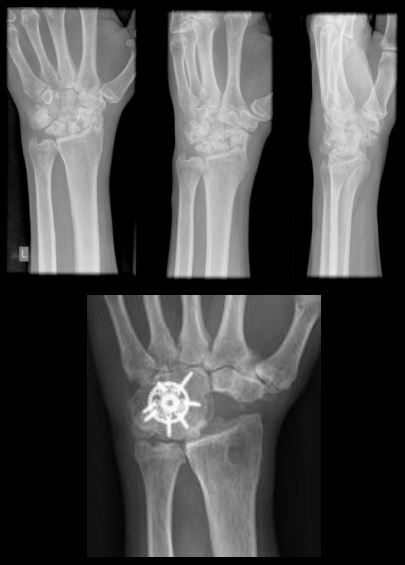 The Proximal scaphoid fragment is attached to Lunate with distal dissociating and rotating‘signet ring” sign on x-rays. 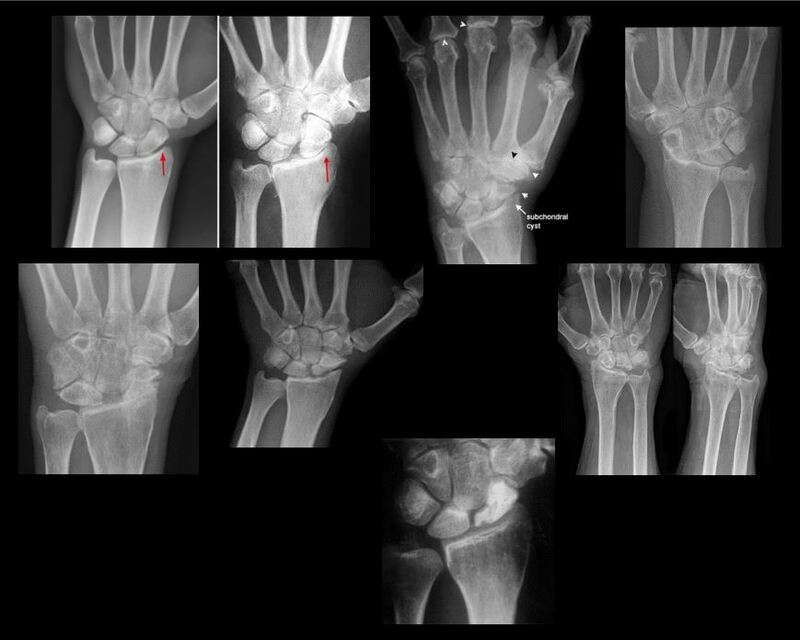 Scapholunate advanced collapse (SLAC wrist): SLLdissociation with progressive intercarpal and radiocarpal DJD and volar or dorsal carpal displacement (DISI & VISI). 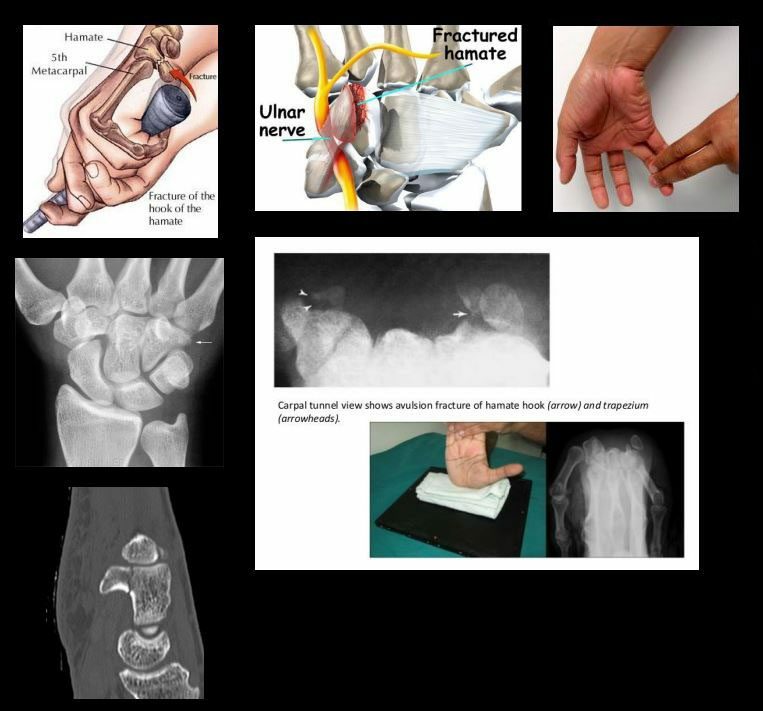 Causes: trauma, CPPD, DJD, Kienboch disease (AVN of Lunate), Preiserdisease (AVN of Scaphoid). 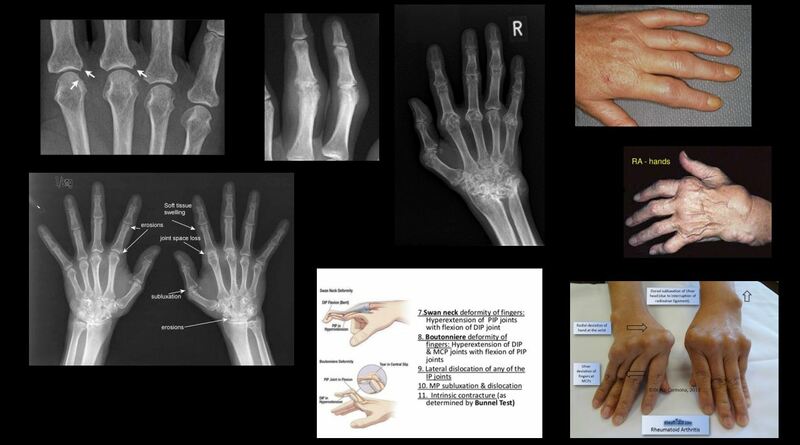 SLL dissociation will lead to Dorsal or VolarIntercarlate aka Intercarpal Segmental Instability (DISIor VISI). Rad Dx: Dx underlying cause. X-rays demonstrate dorsal or volar angulation of the Lunate with increased or decreased scapholunate angle on the lateral view. 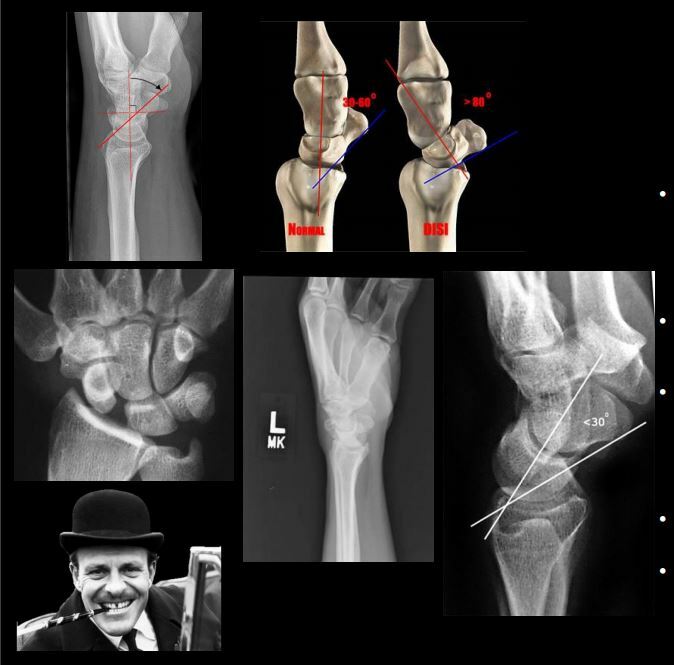 On frontal view: Terry Thomas sign or widening of scapholunate distance 3-4-mm as the upper limit of normal. Triquetrum Fx: 2nd m/c carpal bone Fx. M/C dorsal aspect is avulsed by the tough Dorsal radiocarpal ligament. Cause: FOOSH. Imaging: x-radiography wrist series is sufficient. Best revealed on the lateral view as an avulsed bone fragment adjacent to the dorsum of the Triquetrum. CT may help if radiographically equivocal. Hook of the Hamate Fx: m/c occurs in batting sports (cricket, baseball, hockey, impact by a golf club, etc.) 2% of carpusFx. 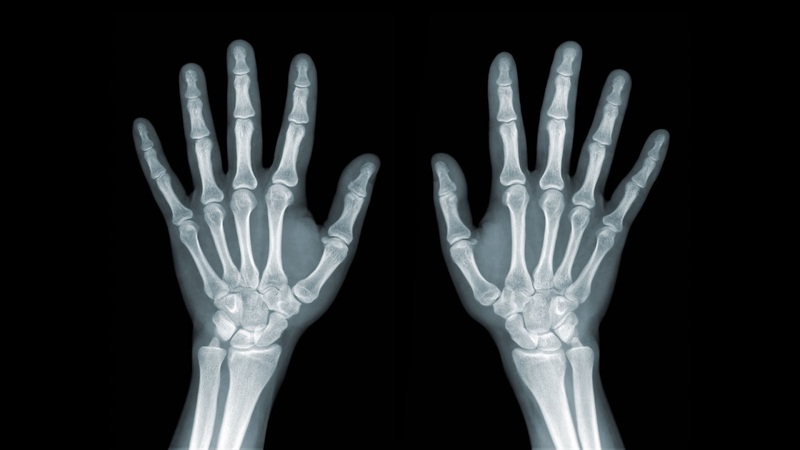 Imaging: x-radiography may fail to detect an Fx unless "carpal tunnel view" is used. CT may help if x-rays unrewarding. Clinically: pain, positive pull test, weak, painful grip. Deep ulnar n. Branch may be affected by the Guyon canal. Rx: usually non-operative, but chronic non-union may require excision. 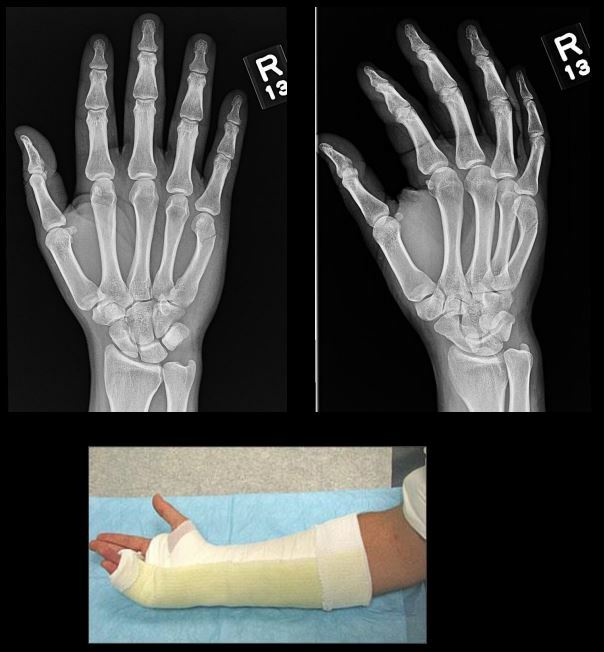 Lunate vs. Perilunate dislocation: Lunate is m/c dislocated carpal bone. Overall infrequent carpal injury. 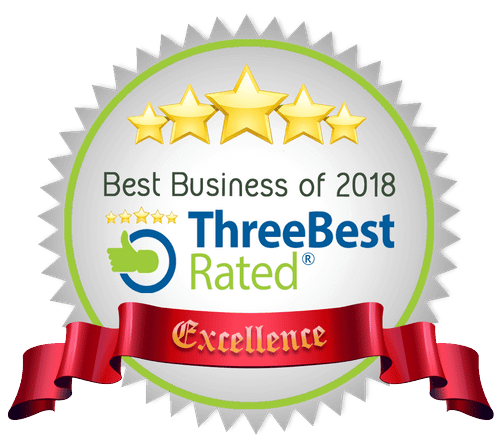 However, often missed! Occurs with FOOSH and wrist extended and ulnar deviated. Imaging: 1st step x-rays. Ifunrewarding or require more complex injury evaluation CT scanning. 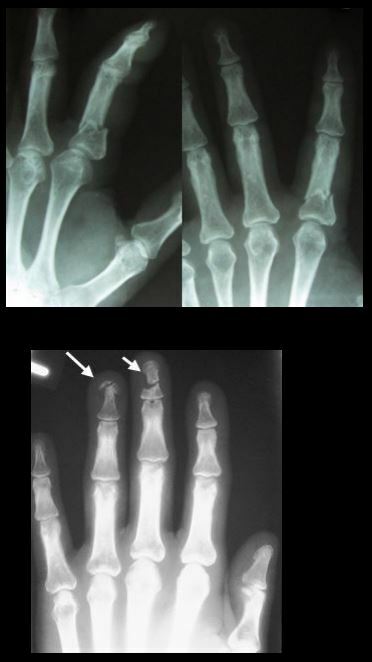 Bennett Fx: intra-articular but noncomminuted impact-type Fx of the base of 1st MC bone of the thumb. X-radiography is sufficient. Gamekeeper thumb: traditionally described as a chronic tear of the ulnar (medial) collateral ligament at 1stMCP in English Gamekeepers' who performed neck twisting/killing of small game. An acute injury may also be named as Skier's thumb. This injury can be ligamentous w/o a fracture and/or an avulsion injury at the 1st proximal phalanx base. Complication: Stener lesion or displacement of torn ligament over Adductor pollicis muscle that cannot heal w/o surgical repair. MRI Dx is required. Imaging: x-radiography followed by MRI to Dx Stenerlesion. MSK US can be used if MRI is unavailable. 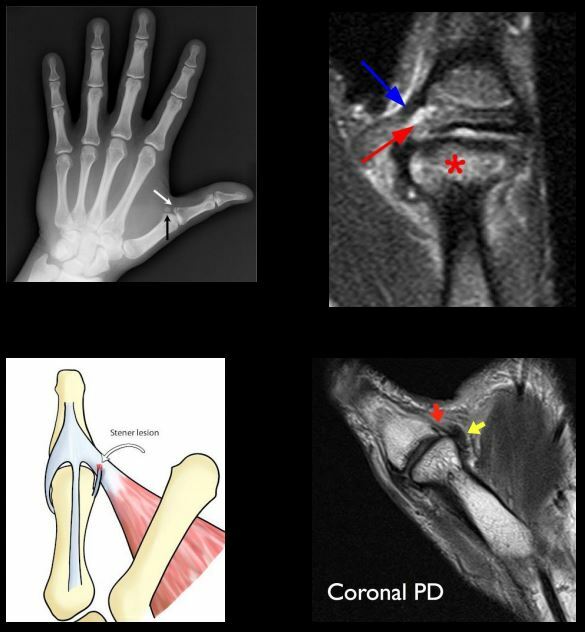 Stener lesion on MRI & MSUS: ulnar collateral stump is more superficial to Adductor pollicis aponeurosis and appears like a low signal mass-like stump forming so-called "yo-yo on the string sign" reported both on MRI and MSK US. Boxer Fx: m/c MC Fx. An extra-articular usually non-comminuted or minimal comminuted Fx through m/c the 5th and sometimes the 4th MCneck-head junction (occasionally through the shaft) resulting in volar head angulation. Mechanism: direct impact as in clenched fist punching hard surface (e.g., facial bones/wall punching) hence 95% in young males. Rad Dx: Fx line transverse or oblique through MCneck with volar head angulation. Evaluate the degree of displacement, critical to report. N.B. 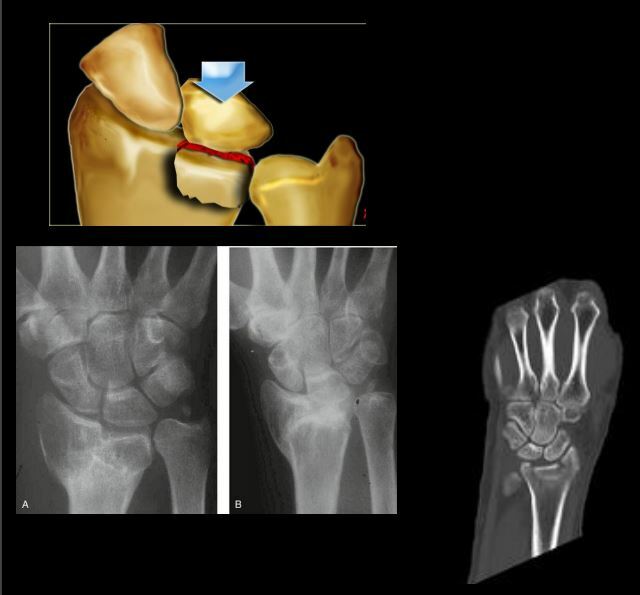 If the same mechanism fractures the 2ndand 3d MC in the same anatomic area, it may require operative care. Rad Dx: if prox phalanx Fx, distal fragment is angled volarly with prox fragment dorsally. Distal phalanx may be angled dorsally. Key observation: nail bed injury, which considered an open Fx with a risk of infection. 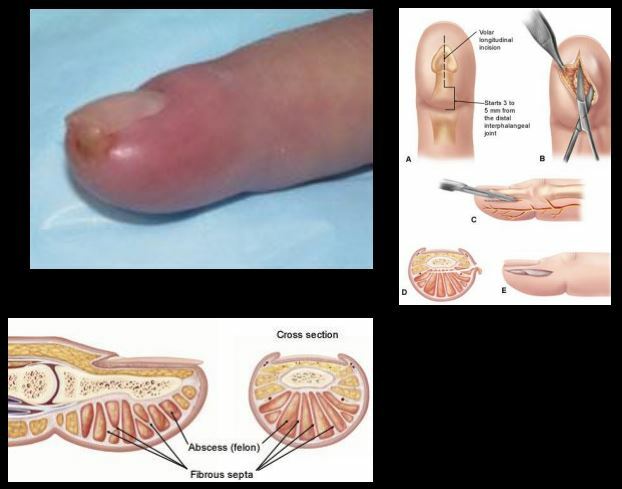 Felon: septic infection of the fingertip pulp typically with Staph.Aureus. Causes: needle prick(diabetics), paronychia, nail splinters, etc. m/c in index and thumb, presenting with pain, swelling, etc. D/t specific pulp anatomy theinfection>swelling leads to pulp compartment syndrome-pressure and necrosis. Incomplete Fx: Greenstick Fx, Torus (Buckle)Fx, Bowing (Plastic) deformity/Fx. D/t FOSHe.g. fell off the monkey bar. m/c affects <10-years-old. 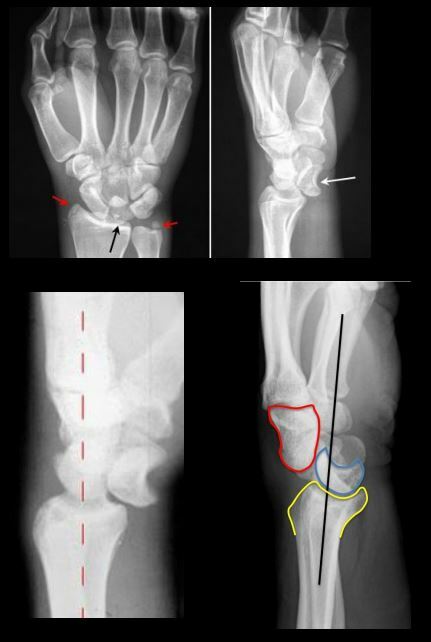 Distal Radioulnar Joint (DRUJ) Instability-common injury following trauma as in FOOSHwith wrist hyperextension and rotation and disruption of DRUJ ligaments and TFCcomplex. 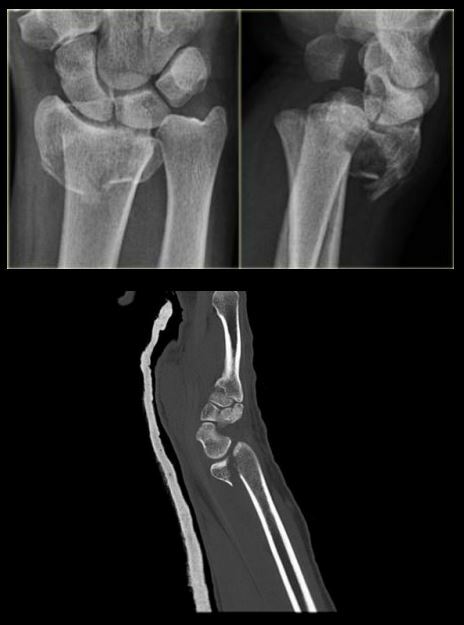 Avulsion of ulnar styloid with the dorsal or volar displacement of distal ulnar should be noted. Imaging steps: x-rays initially, MRI may identify ligaments and TFC damage, MSKUScan help with ligaments tearing. Note: isolated DRUJ volar (top image) and dorsal (bottom image) dislocation. Wrist DJD-typically is secondary to trauma, scapholunate dissociation, SLAC, SNAC wrist, CPPD, Keinboch or Preiser Disease and others. Imaging: typically presents as radiocarpal JSL, subchondral sclerosis,osteophytosis, subcortical cysts, and loose bodies. Typically additional induces intercarpal degeneration and particularly Tri-scaphe joint. MRI may be helpful with early recognition of scapholunate dissociation, Lunate/Navicular AVN. 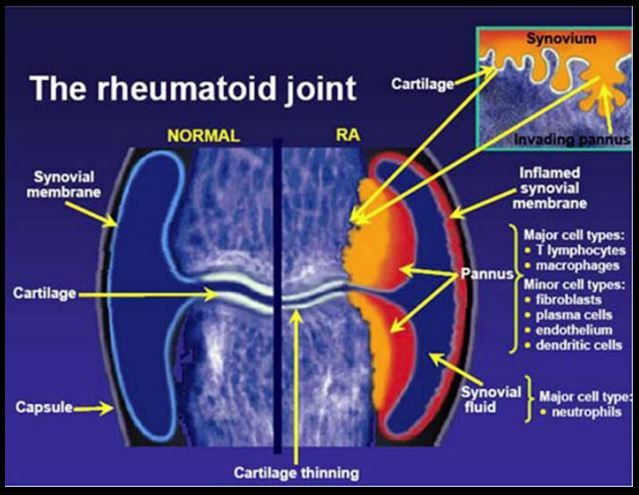 Rheumatoid Arthritis (RA)-chronic systemic inflammatory disease of unknown etiology, targeting synovial joints, tendons with multiple systemic involvement (lung, CVS, Ocular, Skin, etc.) Pathology: Tcell>Macrophage/APC>mediatedautoimmune process resulting in pannus formation and gradual destruction of ST, cartilage, bone, and other tissues. 3% FemalesVS.1% Males. Environmental triggers: infection, trauma, smoking, and others in a genetically susceptible individual. 20-30%may be disabled after 10-years.